I’ve been mulling over this show for a week now, attempting to ensure that the gobsmacked proclamations of “best show this year” weren’t just hyperbole caused by fresh memories. But there we have it – a week has passed and I’m still pretty sure that this night was one of the best gigs I attended this year. 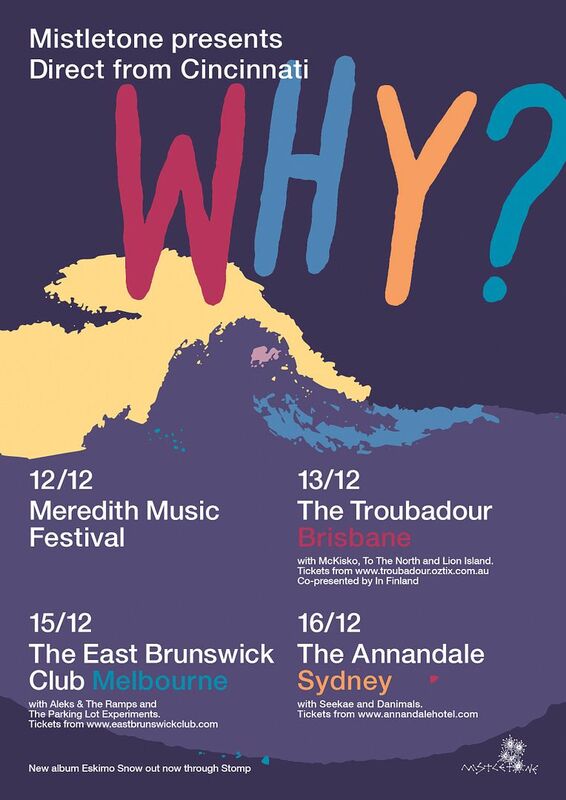 I’ve been a huge fan of Why? since their tune “The Hollows” off the then-forthcoming Alopecia dropped on the web in early 2008. The combination of hip-hop with dramatic, nuanced indie rock sucked me in and I quickly explored their back catalogue and began thrashing Alopecia out upon its release onwards. The album’s never got old since, and it’s use of space and fascinating arrangements, instrumentation and tone has made it something that’s continuously yielded rich rewards. The recently-released Eskimo Snow is a slightly more conventional direction in that’s it’s more song-driven, but still relies on frontman Yoni Wolf’s twisted lyricisms and bizarre compositional approaches. Back to the show. Expectations couldn’t have been higher: aside from all of the fanatacism built from the countless repeats of the aforementioned albums, both of the supports (Kyu and Seekae) have a strong building reputation in Sydney. Kyu opened the evening. The duo first appeared Sydney’s radar for a lot of people when their excellent tune “Sunny In Splodges” was included on the highly recommended New Weird Australia compilation. Their sound is an abstract combination of understated minimalistic songwriting, loops, vocal effects, keyboards and the odd floor tom. I’d seen the band once before and was eager to catch them again. The set began with them beginning more strongly than the previous time I caught them, but a few technical glitches and a crowd with a wavering attention span had the set wobbling its way through the second half. At their best, they’re entrancing. At their worst, they’re can find themselves in danger of being a little too twee and a little too gimicky. The performance confirmed for me that the group’s talent is unquestionably brilliant, but the actual execution still needs some fine-tuning. This being said – a pub is probably not the best place to see them and I look forward to catching them in a different location, which I suspect will yield better impressions. The crowd’s anticipation for Seekae was apparent, made only more evident by delays in the soundcheck for the set. This was my first time catching the trio live, and I was blown away: this is definitely one of Sydney’s most exciting emerging groups at present and I absolutely can’t wait to see where they go. Their sound is a combination of atmospheric electronica, post-rock and hip-hop with the sound being fresh and absolutely immersive. It was great to see Ivan from the also-brilliant Ghoul make a number of appearances on guitar and vocals. Not much more needs to be said – see this band if you get a chance. I predict great things for them if they continue on their current trajectory, and having them completely win the crowd over like they did is no simple feat and confirms that everyone was pulled in by their work. Jonny wondered if the band had won the night and I feared that the evening might have already peaked. It was a damn close race, but Why? took the cake. When you listen to a Why? album from a musical point of view, you’re enveloped in arrangements that are detailed, unique, engrossing and frequently gorgeous. Much of the beauty is contained within the interlocking parts, the exceptional mixing and the impact of the rhythms. How much is a five piece going to be able to actually get that across live? As it turns out – near flawlessly. The band executes the songs like a finely tuned machine, yet delivered just the right amount of unhingedness and vigour that’s needed to actually make a show out of the performance. Yoni doesn’t drop a beat as he works his way through lyrical acrobatics and stalks the stage. His brother, Josiah, bounces on his kit like a possessed bobblehead effortlessly dropping rock solid grooves, while the remaining members on bass, guitar and keys make all of that intricacy on the album look like a piece of cake. Incredible – and then some. The explosions of fuzz bass on “These Few Presidents”? Devastating. The plaintive emotion of “Blackest Purse”? Tear jerking. The badassery of “Sky For Shoeing Horses”? I couldn’t stop grinning. “Sydney! Oh yeah, this is a good one. This is a good show” mumbles Yoni with barely-suppressed glee a couple of songs in. I don’t know if he announces a bad show when they’re having one, but it seems the band are really feeding off the crowd. I can’t quite pick where the crowd is coming from. Certainly there’s been some hip-hop crossover judging from the hands in the air floating to the beat, perhaps with some people migrating from the old cLOUDDEAD days (Yoni’s old group). For many I’m sure there’s been the discovery via Internet (like myself). There’s a weird yobbo dynamic present as any time a verse is sung containing some of Yoni’s more twisted lyrical imagery (see: “The Hollows”, “The Vowels, Pt. 2″) the crowd launches into it by positively yelling it back. I wonder if that was a lasting impression of Australia for the group. The extensive work of the band’s front-of-house sound engineer has to be noted. The guy put the icing on the cake by ensuring that many of the details present in the album were represented by adding delays, reverbs and compression to the mix live. As a result, he spent the entire set riding the effect busses and adding immense amount of detail through – it’s the kind of detail that’s not often seen for a show with an audience size of the Annandale’s capacity. It gave the set exactly the polish it needed and I thought it lent additional distinction to the band’s performance. Was it the best gig I saw of ‘09? It’s a tough call – there were many great, great gigs this year, and it’s hard to pin it on one show – but it definitely came close. I’m hugely glad I went and if you get an opportunity to see this band, don’t pass it up. It’s one hell of a show.